‘Hockey’ and ‘Canada’ are practically synonymous, especially this time of year when the Stanley Cup finals are front and centre. Someone not fully versed in hockeyness and Canadianisms might find the connection incomprehensible. Well, below are five titles to help new fans and new Canucks enjoy the sport’s impact. 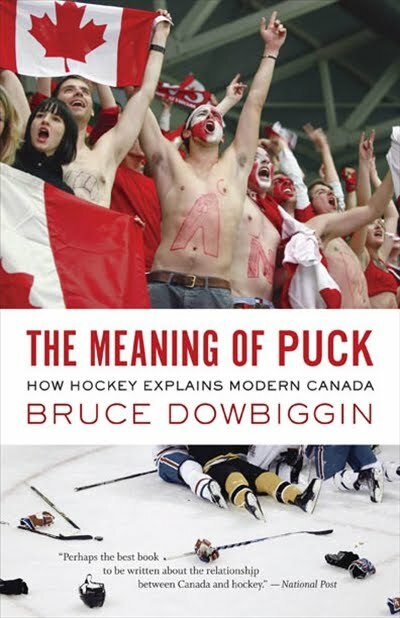 Where Holman’s book is an objective study of hockey, Dowbiggan’s is deeply involved and disappointed. His perspective is less than thrilled with Canada and its sport. He notes the odd choices for icons (a Tom Cochrane song that promotes minor hockey league violence, and of course Don Cherry? ), the obsessed American bashing versus American team ownership, the pacifists who turn violent at rink side, and many other paradoxes and problems with our sport. This massive hardcover is designed to parallel (parody?) Canada: A People’s History from the CBC. This coffee table book discusses the origin of hockey and the birth of the NHL, and the draw for spectators (past and present). It also lists key figures in hockey history and their affect on the sport. Written by one of Dartmouth’s own local historians, this book gives the origins of hockey itself. This book examines everything from a similar Mi’kmaq sport to the development of the hurley stick, the evolution of the rules to the birth of local communities and facilities based around the past time. 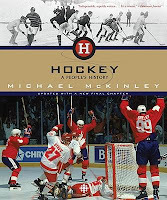 This book takes a more academic approach to hockey history, and organizes the findings into three main sections. There is the community identity that comes from sport loyalty, and Holman evaluates who we were and who were becoming, and who we aren’t: specifically Americans. This chapter also looks at moments that redefined us, like the 1972 loss to Russia, the paradox of Canadian fans (who are at once peaceful and bloodthirsty), and even the role of hockey in Canadian advertising. 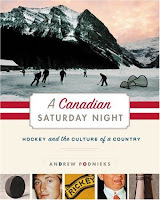 The second chapter looks at the scope of Canadian sports fiction and how archetypes are expressed through hockey stories. The third chapter is devoted to hockey as a commodity, including the first spectators, and how non-Caucasian and non-males came to be fans. This author of over 50 hockey titles may have had Douglas Coupland’s Souvenir of Canada in mind. Two page spreads offer interesting vignettes on unexpected hockeyisms. ‘Canada’s Royal Wedding’ (Wayne Gretzky and Janet Jones). ‘The Zamboni Man’. ‘A Museum of One’s Own’. ‘Chiclets’ (not the gum...the lost teeth).